The Syrian Arab News Agency reported on an impending false flag CW incident in Idlib province to be wrongfully blamed on government forces. On Saturday, Russian Defense Ministry spokesman Igor Konashenkov explained what’s coming, what happened several times before, most recently last April in the Douma – a fake US/UK false flag incident, wrongfully blamed on Damascus, followed by US/UK/French warplanes terror-bombing Syrian targets, naked aggression based on a Big Lie. Ahead of the US/UK-orchestrated false flag, Pentagon warships were deployed in the Persian Gulf, carrying cruise missiles, along with a B-1B strategic bomber sent from Udei airbase in Qatar, armed with AGM-158 JASSM air-to-surface missiles. Hostile statements by senior US, UK and French officials warned of “their intention to respond in the most resolute way to the alleged chemical weapons use by the Syrian government” – signaling they intend terror-bombing Syrian targets in response to their planned false flag, complicit with al-Nusra and White Helmets terrorists they support on the ground. “According to information confirmed…by several independent sources,” US-supported al-Nusra terrorists intend conducting a false flag CW attack, wrongfully blamed on government forces. 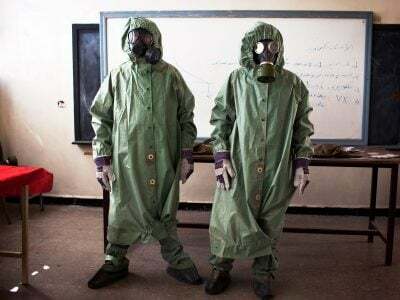 Large amounts of chlorine gas delivered to the town of Jisr ash-Shugur in Idlib province apparently is the CW of choice for the latest planned incident. According to AMN News, Russian warships were deployed off Syria’s coast ahead of likely US, UK, French terror-bombing following an expected CW false flag incident, wrongfully blamed on Damascus. “This latest move by the Russian Navy comes just 24 hours after they sent three ships en route to the Port of Tartous in western Syria,” AMN News reported. Large numbers of elite and other Syrian forces were deployed to Idlib province ahead of the upcoming offensive to free the territory of US-supported terrorists. Separately, US State Department official William Roebuck met with Kurdish YPG fighters, infesting the so-called Syrian Democratic Forces, and US troops illegally occupying northeast Syrian territory. “We are prepared to stay here” indefinitely (supporting Israel), he said – even after ISIS is defeated. What’s going on is further proof of the Trump regime’s intention to continue waging endless war on Syria for regime change – obstructing all-out Russian conflict resolution efforts.